Our second September release is not a typical one for us as it's an EP. 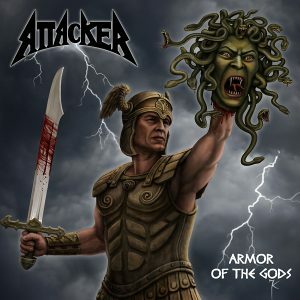 While already writing songs for their 7th full-length, the US metal veterans ATTACKER decided to first offer their fans an EP featuring 4 brand new studio and 2 live tracks, titled "Armor of the Gods" and clocking in at 35 minutes. 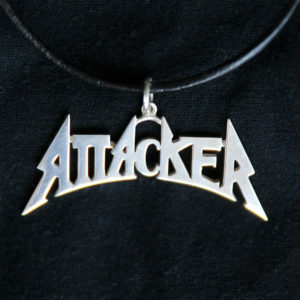 The live tracks are from their gig at the Up the Hammers festival in Athens in 2017 and show perfectly that ATTACKER are a force to be reckoned with live as well. The studio ones are their typical US power/heavy metal sonic attacks with masterful guitar work, pounding drums, pummeling bass and air raid siren style vocals of the one and only Bobby "Leather Lungs" Lucas. The legendary producer and engineer Alex Perialas (Metallica, Overkill, Testament, Anthrax, M.O.D., S.O.D., Flotsam & Jetsam, Nuclear Assault, Exciter...) helped to make sure the songs sound top notch. On September 15th, the band will visit Europe again to play for the first time in France at Pyrenean Warriors Open Air where they'll share the stage with GRIM REAPER, MEDIEVAL STEEL and OZ, among others, and in October they will perform in California at the US most revered old school metal festival Frost and Fire, alongside other legends like CIRITH UNGOL, SATAN, EXUMER, PAGAN ALTAR and others. You can find more info about "Armor of the Gods" and see the high-res cover on the page of this release. Until September 7th midnight Standard Central European Time (UTC+1), you can order this CD from our SHOP page with German shipping rates, which are especially convenient for orders from Germany and from outside of Europe. It's available also in convenient bundles with the previous albums "Sins of the World" and "Giants of Canaan", with sterling silver logo pendant and "Sins of the World" T-shirt (last T-shrts left!). After that date, we will change the shipping rates back to the Italian ones. The album can be pre-ordered also as digital download (in lossless formats) from our Bandcamp page. Later on, it will be distributed digitally by CD Baby and made available also from iTunes, Amazon MP3, eMusic and other retailers.